Now Available: Cel Division Mini Prototype Series! Following on from his Ugly Mikki series last month (read HERE), Cel Division is back with another mini series of weird & wonderful creations from his mind. We are happy that these are starting to see the light of day, since we first saw them on Cel Division’s Instagram (@celdivision) back in October 2017. We love how they are crazily unique characters, that you know are all up to mischief in someway or other. We’d happily watch these in an animated series. The mini series, which is a prototype for a future larger release can be purchased for $60 (£46) on the Cel Division store HERE. There is only one set available, and each piece stands at around 2inches tall. 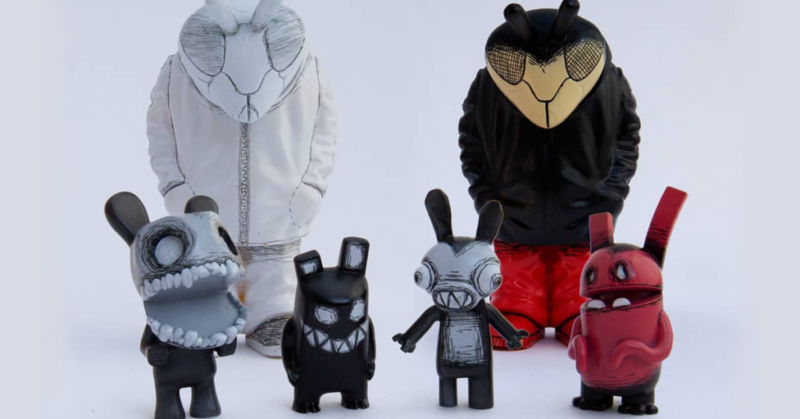 As well as prototype mini series, Cel Division has also placed two one-of-a-kind Wasp characters on their online store. The OG colourway can be purchased HERE for $25, and the Take on Me style Wasp can be purchased HERE also for $25 (£19).